Researchers with the NOAA's Okeanos Explorer expedition recently spotted an anemone which one member called "whopping big." According to an online post, the sighting occurred on July 30. Footage of the event shows a white anemone, estimated to be around 8 to 12 inches across. 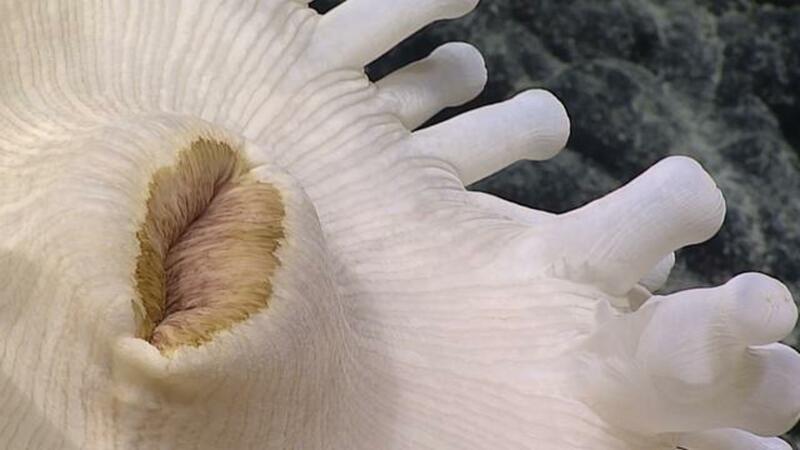 Researchers can also be heard marveling at its unusual rounded-tipped tentacles with a brown point in the middle of each one. This anemone was found during an exploration of the Alba Seamount which has been dated back to the Cretaceous period. The footage was gathered as part of NOAA's Deepwater Wonders of Wake mission exploring the "deep-sea ecosystems and seafloor in and around the Wake Atoll Unit of the Pacific Remote Islands Marine National Monument."